1. 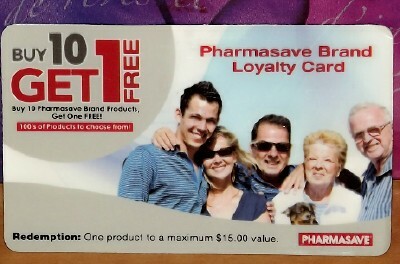 "Buy 10 Pharmasave Brand Products Get 1 Free Card"
These cards are available at the till by asking the cashier for one. Present the card each time an eligible Pharmasave Brand Product is purchased for the cashier to record it on the reverse side with a stamp. Upon completing the 10th eligible purchase, you are entitled to choose a free product of any brand in the store up to a value of $15.00. FREE product excludes codeine products, Pharmasave Phone Cards & Gift Cards. This is a picture of what the front of the card looks like. This is the back of the card where eligible purchases are recorded. As you can see from the picture it is not necessary to pick up your FREE $15.00 item upon filling the card if for whatever reason it's just simply not a good time. The cashier will note this on the back of the card and you can return when it's a more convenient time to pick out your FREE item. 2. "Buy 10 Jameison Brand Products Get 1 Free Card"
These cards are also available at the till by asking the cashier for one. 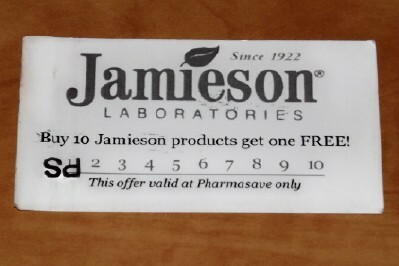 Present the card each time a Jamieson Product is purchased for the cashier to record it on the reverse side with a stamp. Upon completing the 10th eligible purchase, you are entitled to choose one FREE Jamieson Brand Product. 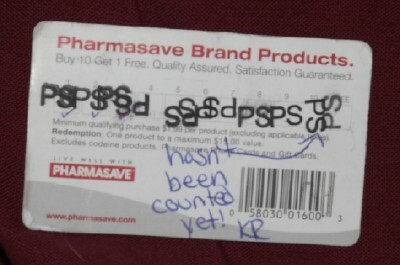 This Rewards Program card is only valid at Pharmasave. There is no value limitations, exclusions or disclaimers regarding taxes declared on the card.